1.Preheat oven to 350°. Cook lasagna noodles as label directs. 2.Meanwhile, in large skillet, heat oil over medium-high heat. Add mushrooms and cook 4 to 5 minutes or until mushrooms are cooked through and almost all liquid has evaporated, stirring occasionally. Stir in garlic, basil and oregano, and cook 1 minute. Gradually add kale and cook 3 to 4 minutes or until wilted, covering between additions and stirring frequently. Transfer to large bowl; fold in chopped turkey. Makes about 10 cups. 3.Meanwhile, in blender, combine tomato purée, water, sun-dried tomatoes, salt and pepper. Blend until smooth. Makes 7 cups. 4.In a medium bowl, stir together ricotta, chèvre and egg whites. Makes 2-1/2 cups. 5.To assemble, spray 13 x 9-inch baking dish with nonstick cooking spray. In bottom of prepared dish, spread 1 cup tomato mixture. Top with 3 noodles, 1/3 turkey mixture (about 3-1/3 cups), 1-2/3 cups tomato mixture, 1/3 cheese mixture (about 3/4 cup) and 1/2 cup mozzarella cheese. 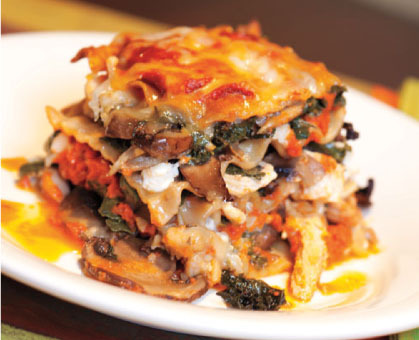 Repeat layers 2 more times; top with remaining 3 lasagna noodles and 1 cup tomato mixture. Sprinkle with remaining 1/4 cup mozzarella cheese. 6.Bake 1 hour to 1 hour 10 minutes or until edges are bubbly and top is browned. Let stand 10 minutes before cutting.